Our “Musikwerkstatt” offers diverse programming geared toward all age groups and types of schools. It contains musical instruments, sound installations, costumes, and craft supplies which are meant to complement a visit of the exhibition. 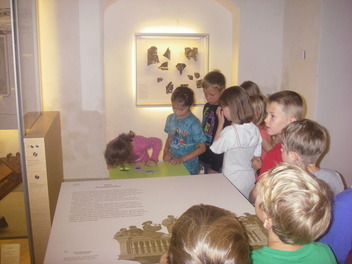 Guided tours for school classes are available by appointment. The workshop is accessible from 10 am to 5 pm as part of our permanent exhibition. Hi there, I am young Heinrich! Want to get to know me better? Then come to the Heinrich Schütz House! We can go on an expedition together: a total of nine little treasure chests await! What’s inside? I can’t tell you, as it’s meant to be a surprise. But here’s a hint: it’s something to play with, touch, look at, conduct to, colour, and pet. Curious? Then see you soon! Children will be taken on the children’s trail and receive an interactive guided tour that focuses on the daily life of Heinrich Schütz and how it was impacted by the Reformation. 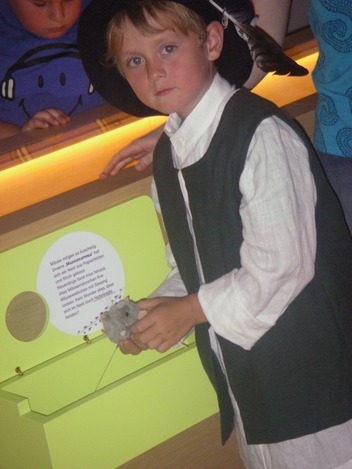 Young Heinrich will show objects that children can touch and try out. The life and works of Heinrich Schütz were shaped by the Thirty-Years War which the composer had to endure it its entirety. This guided tour focuses on the works he wrote to mark political occasions as well as selected compositions that reflect on grief, confidence in one’s faith, and longing for peace and thus provide an alternative to a world shaped by war. Students will listen to musical examples and locate comments made by Heinrich Schütz in one of his letters. 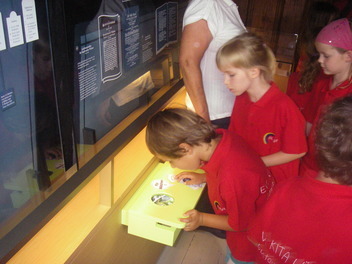 Moreover, students will be given a worksheet with quiz questions related to the tour. 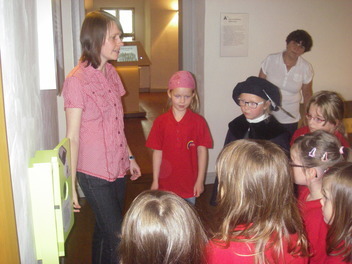 This guided tour brings together the school subjects music and history via Heinrich Schütz. Emphasis will be placed on the court Kapelle, the duties of the court Kapellmeister, the dynastic linkages of courts, and Schütz’s musical oeuvre. Students will also explore the sounds of the court Kapelle at the audio installations that can be found next to the display cases that house historic instrumentsand view original early prints of his works. A short film provides concise information on how Heinrich Schütz composed. The music of Heinrich Schütz is a precious treasure: it brings to life good thoughts from the Bible. Like Martin Luther before him, Heinrich Schütz had his works printed. 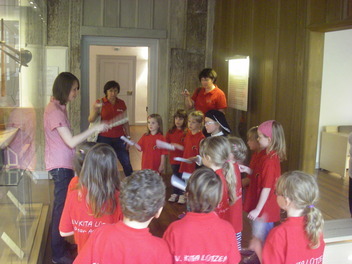 On the children’s trail tour the young visitors will learn about the Bible and how music was printed during Schütz’s lifetime. They will create a picture while listening to music by Heinrich Schütz, using potato print as well as different painting and spraying techniques. 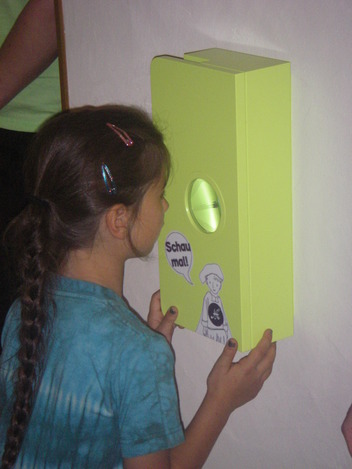 Are corded piece of sacred music by Schütz“Wie ein Rubin in feinem Gold leuchtet” (“As a ruby sparkles in a fine gold setting”, from his Kleines Geistliches Konzert, sung by a boy soprano) invites children to listen actively and will capture their imagination. A story will be told and accompanied by music that illustrates the role of music in the daily life of a town shaped by Lutheranism during Schütz’s lifetime. Locations and people involved in the story are expanded upon in a guided tour of the town of Weissenfels. The canon “Bruder Jakob” (“Are you sleeping, Brother John”/“Frère Jacques”) will be studied, with assigned roles. The Story of the Nativity will be told through music, with assigned roles and musical examples drawn from Heinrich Schütz’s Christmas Story; Christmas carols will be sung and played. Texts with musical content will encourage children to explore the sound potential of various instruments and to experience and create stories from the life of Heinrich Schütz together. Explore musical instruments from Schütz’s lifetime: play in a trio; do a puzzle; try out and play selected instruments; build and create simple percussion instruments. 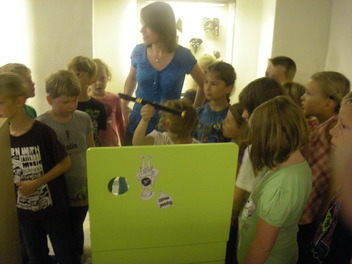 A funny way to discover the exhibition on your own; watch films and listen to music; interactive stations. One of the main tasks of the Heinrich Schütz House staff is to carry out scholarly research on Heinrich Schütz’s life and works as well as on the rich musical history of Weissenfels, and to disseminate findings in exhibitions, events, and publications that will appeal to visitors. Staff also carry out research on music at the princely Weissenfels court and musical life in the town of Weissenfels, especially in the town church of St. Mary’s. The Heinrich Schütz House belongs to the working group “regional music culture” which is part of the heritage organization “Landesheimatbund Sachsen-Anhalt”. The latter focuses on carrying out research on the musical history of Saxony-Anhalt. Between 1929 and 1935 the Weissenfels town museum acquired valuable early prints of Schütz’s musical oeuvre, amounting to a total of 28 part-books from five works: Auferstehungshistorie(1623), Cantiones sacrae (1625),Kleine geistliche Konzerte, part II (1639), Geistliche Chormusik (1648), and Symphoniae sacrae, parts II and III (1647 and 1650, respectively). The collection also includes the printed funeral sermons for Heinrich Schütz (1672) and his brother Benjamin Schütz (1666), the Dresdner Hofgesangbuch (1694), and the libretto of Dafne in Martin Opitz’s Opera poetica (1646). Two part-books of the Eisenach cantor Theodor Schuchardt (ca. 1660) contain individual handwritten parts by Heinrich Schütz for “Esaia, dem Propheten, das geschach (Deutsches Sanctus)” and “Unser Herr Jesus Christus, in der Nacht, da er verraten ward”, as well as Secunda Pars “Desselbigen gleichen nahm er auch den Kelch” (Words of Institution). Most of these objects are now part of the permanent exhibition of the Heinrich Schütz House. The Heinrich Schütz House’s archives contain the music collection of the former Ephoralbibliothek Weissenfels (the repository of the town’s Lutheran congregation). The collection includes 351 eighteenth- and nineteenth-century manuscript scores, including valuable autograph manuscripts by renowned composers, numerous copies, and unattributed works. The holdings are catalogued in the International Inventory of Musical Sources (RISM) under the siglum “D-WFe” and can be searched online. Researchers may access the collection in our archive by appointment only. In 2010, 2012, 2015 and 2018 the Weissenfels Music Association “Heinrich Schütz” organized a series of concerts entitled “Musical treasures of Weissenfels”. They featured performances of works by Johann Ernst Bach, Georg Anton Benda, Carl Ditters von Dittersdorf, Johann Friedrich Doles, Francesco Gasparini, Carl Heinrich Graun, Johann Gottlieb Graun, Carl Hartwig, Johann Adam Hiller, and Johann Gottlieb Naumann, as well as the Weissenfels cantor Johann August Gärtner (1762–1823), who acquired a substantial part of the collection. Michael Schönheit directed the soloists, the Collegium Vocale Leipzig, and the Merseburger Hofmusik; the works were arranged for performance by Dr. Maik Richter. The Baroque music association “Mitteldeutsche Barockmusik e.V.” sponsored the concerts which were broadcast by the Central German Radio station MDR Figaro.